The window at The Book Cellar, Chicago. Barrie’s book also has an awesome cover. 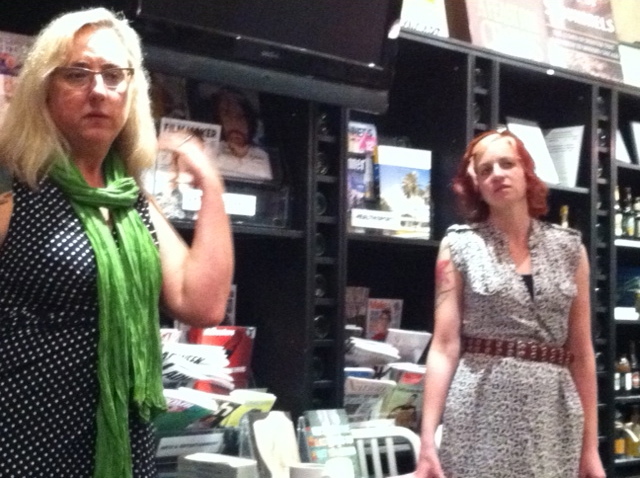 I recently spent 36 hours in Chicago, in and out for an event May 9 at The Book Cellar. I read with Barrie Jean Borich, author of the recent Body Geographic and my former mentor in the Loft Mentorship series. Barrie and me at The Book Cellar, Chicago. Barrie mentioned that there seem to be a lot of cemetery enthusiasts in Chicago who might like my book. When she said that, I was reminded of a story I hadn’t thought about for years: the story of Resurrection Mary. They say (I love the “they” in “they say”!) that through the years, a young woman has been spotted at different times walking along Archer Avenue in Justice, just outside of Chicago. She’s dressed as if ready to go to a party. She’s been picked up by drivers several times (or so “they” say) and she always asks to be let out in front of Resurrection Cemetery. I had totally forgotten about this story. It was one that mesmerized me as a child (if you’ve read my book, then you know of my childhood fascination with the supernatural–Resurrection Mary was part of this, though I don’t mention her by name in my book). It made me wish I had planned more free time on this trip. The next time I’m in Chicago, I definitely am going to Resurrection Cemetery. Here’s the “Unsolved Mysteries” segment on Resurrection Mary. I frankly do not have any creepy cemetery stories of my own. Do you? If so, please share! I’ve never had anything odd happen to me while at a cemtery, aside from stepping in holes, being hissed at by geese and, of course, strange looks from other cemetery patrons as i lie on the ground to try and get a good photo. However, while visiting a former convent a few months ago, I had an interesting experience. I had taken photos all over the grounds, their cemetery in particular, and was finishing up on the far side of the convent, itself. I had my camera up, trying to capture one of the doors. I had the camera up, concentrating, when I felt a VERY FIRM tap on my right shoulder. It must be Sister Elizabeth, I thought. I lowered my camera, turned to the right, NO ONE WAS THERE! There was no mistaking that I was tapped, I got a shiver. I finished up and left at that point. Maybe I had overstayed my welcome? I love it! That is definitely creepy!